Every receiver following the the ball carrier should lay on the ground, they can get up only when the ball carrier has advanced 1 meter, that is the person that will pass to them. 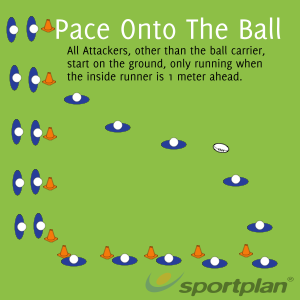 They continue down the line, and when the ball gets to the end of the line it is passed to the first receiver in the next line. Players need to experiment with depth, and not be afraid to push the timing of their support run to the limit. Passes need to be weighted correctly in terms of type, speed, distance, and timing. Communication needs to be at the heart of the attack, players need to not only talk, but to listen. Support players hit the ball at speed, the pass should invite them onto the ball at pace. Targets needs to be presented, hands need to be out.